Last week I was lucky enough to receive this most gorgeous fabric in the post. It flew all the way from Belgium and Isabella was so excited when I told her it was coming - she loves cats! You might have seen a sneak peek of this dress on instagram. I'm new over there so come say hi! 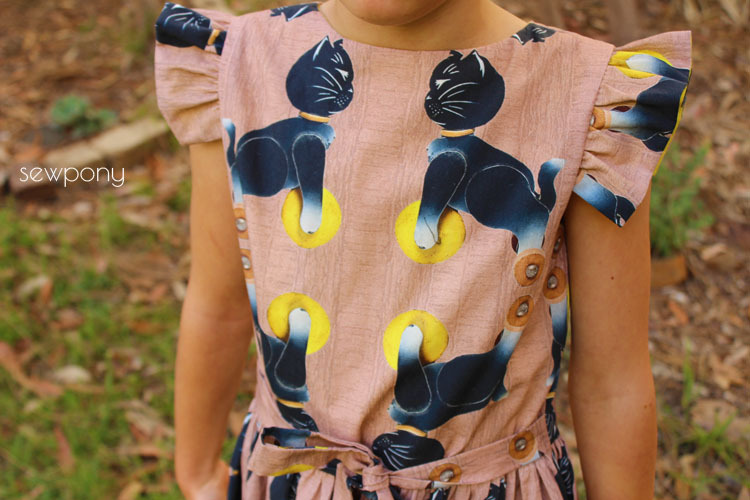 The fabric is called "vintage kitten" and was designed by Petra - her brand name is Melkbrigade and it is supplied by the beautiful Belgium fabric store - Bambiblauw. 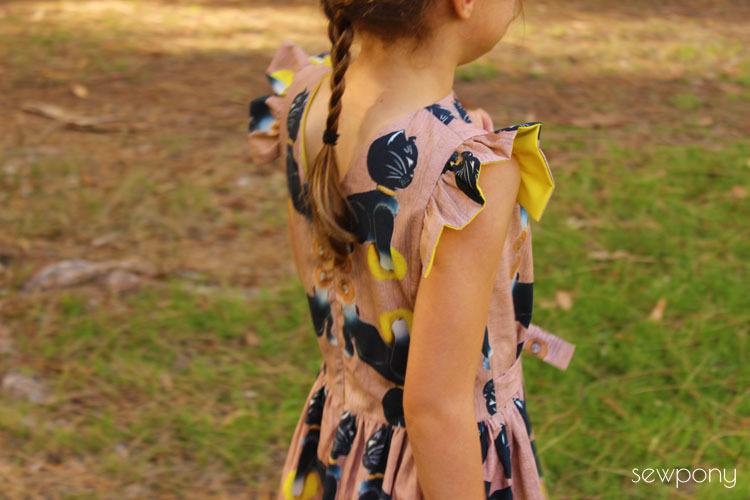 The back story to this print is that after An from StraightGrain sent me the gorgeous summer swans fabric (also designed by Melkbrigade) and I made this dress, Petra saw it on facebook and commented and showed me what her new fabric looked like (vintage kitten). I told her how much I loved the look of the new fabric and asked if I could pay to have some sent over. Leiselot from Bambiblauw graciously replied and sent me the fabric as a gift - thank you very much! The fabric also comes in a jersey. The cotton fabric I received is beautifully soft and drapes very nicely. I ended up trying out a new pattern design for this dress. It features a slightly boatneck shaped neckline at the front which drops down into a V shape at the back. The sleeves are gathered rectangles and the gathered skirt is accented with a tie which can be done up at the front or the back. Below you can see the dress with the tie at the back (well you can't see the tie, but you can see that it is not at the front!). I lined the bodice and sleeves in a bright yellow cotton to pick up on the yellow on the kittens' wheels. I really like how the dress turned out. I would prefer to drop the front neckline by about a centimetre but that would mean chopping some of the kittens' heads off which was out of the question! I plan on developing this pattern but with a few changes that will make it more unique...stay tuned! I was chatting with An over email and we discovered that we were both expecting some of this gorgeous fabric in the mail so decided to coincide our blog posts about it. 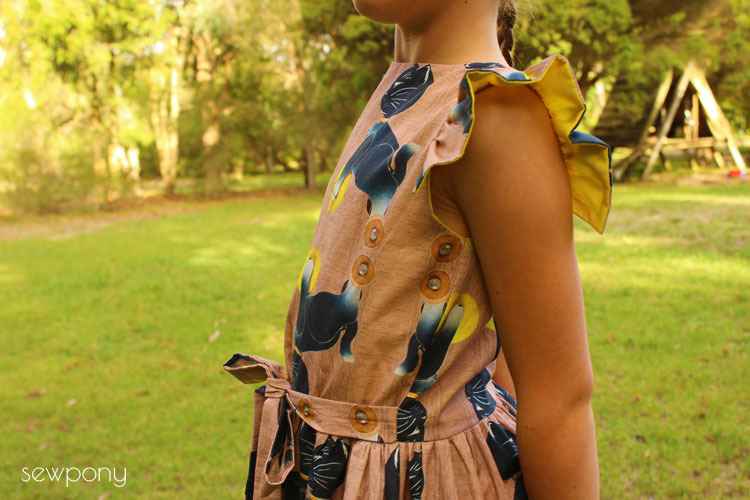 An has made a lovely dress so make sure you head over to her blog to see!! Thank you very much Leiselot (Bambiblauw) for sending us the beautiful fabric! 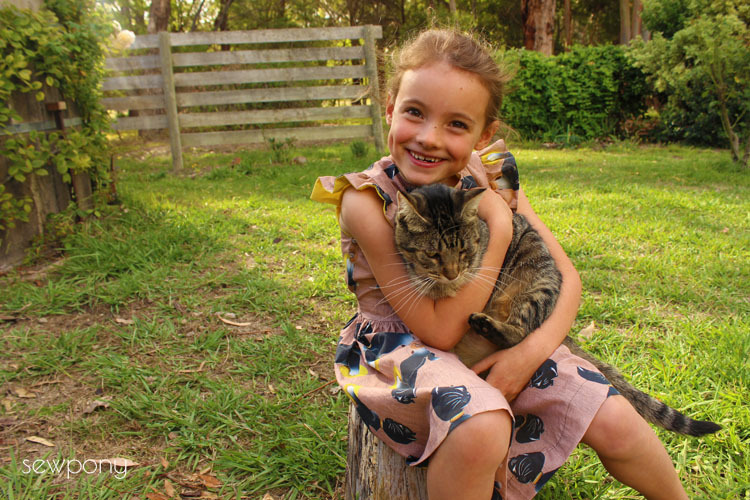 Isabella loves her new dress (here she is with her beloved cat, Rosie). 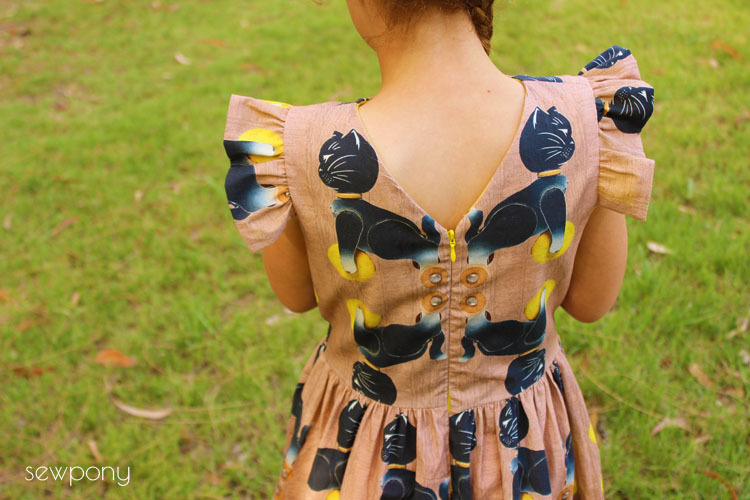 Such a pretty dress, and in such fantastic fabric! Looking forward to seeing what your finished pattern looks like - I really love that V-back. What a beautiful dress and a great pattern. Looping forward to see the other options. This dress is gorgeous! I liked your photo on Facebook a few days ago, and I got a message from one of my babysitting families saying that they would love me to make a dress just like the one they saw me liking on Facebook :) I will have to copy this one I'm afraid! 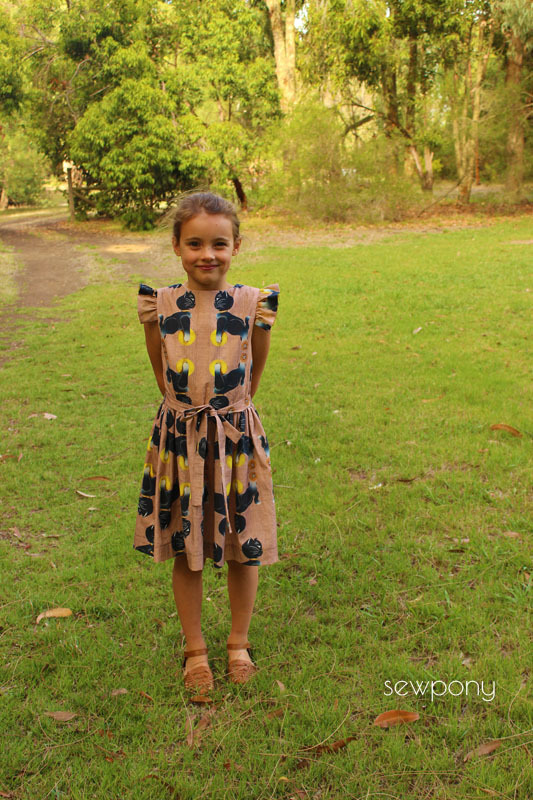 Perfect dress to show of this fun print! Oh man I loooove that fabric and your dress design works so perfectly with it!! Adorable. The dress and the fabric are simply stunning! 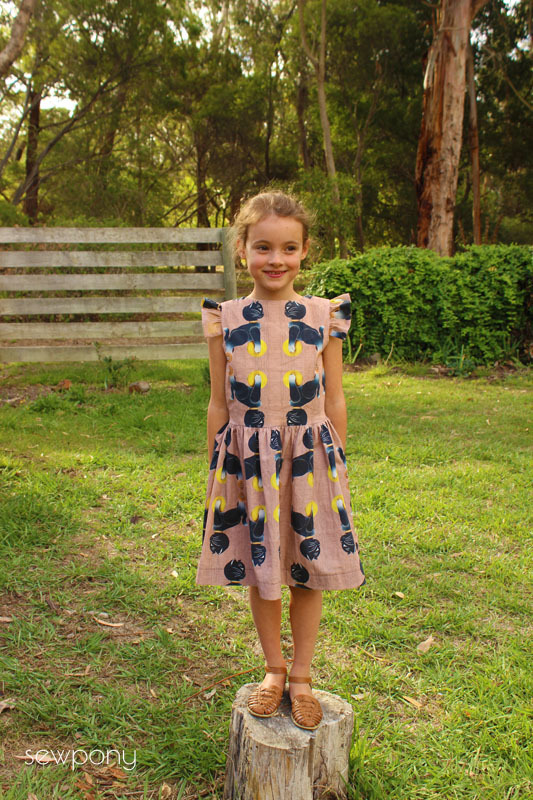 Hi - your kitten dress pattern is awesome - so is the gorgeous fabric of course. I would love to make this dress for my granddaughter of 11. Please let me know when the pattern is available - I love everything about it.